STANFORD, Calif. -- There was a time not too long ago when some fans believed that now 14-time Grand Slam champion Serena Williams could be dismissive of tournaments outside of the majors and the WTA super premier-level events. But that clearly is not the case anymore, as two days after winning her fifth Wimbledon singles title and the doubles crown with her sister Venus, Serena was at Stanford’s Bank of the West Classic, practicing twice, signing autographs and doing a fair amount of media, all with a smile on her face. "It's really, really, really weird, but I've never felt this good," she said. Serena made the effort to come back to Stanford despite her non-stop play over the past two weeks because she believes it’s the place that began her long climb back to the top of the Grand Slam heap. Because she has cut such a dominant figure over the years and has pulled off so many spectacular victories after returning from injuries, it was assumed that in June 2011, when she came back after nearly a year off the tour due to blood clots, that she would immediately put her stamp on the game, but it took a little longer than that. She was unable to win the tournament at Eastbourne and then lost early at Wimbledon, so when she came to Stanford, she was hungry for success. She then proceeded to feast on a five-course meal of mostly stellar foes to win the title: Anastasia Rodionova, Maria Kirilenko, Maria Sharapova, Sabine Lisicki and Marion Bartoli, who had upset her at Wimbledon. She would notch another 13 straight wins through the Emirates Airline US Open Series that took her all the way to the final of the US Open, when Australian Samantha Stosur upset her. "This is the place that spurred me on last year," she said of Stanford. "I had a great summer, and that propelled me with getting a lot of confidence, so that really helped. I definitely wanted to come back and try to redo that, but maybe do 19 straight this time." On Wednesday at Stanford, Serena took care of NCAA champion Nicole Gibbs, 6-2, 6-1, in a match that was a bit tougher than the score. Serena admitted to being sluggish, and no wonder: Due to the eight-hour time difference and jet lag, she woke up at 3:30 a.m. on Tuesday (believe it or not, the social-media lover began tweeting) and then again at 3:30 on Wednesday morning. "I can’t believe I was actually out there playing," said Williams. But she actually played efficiently and didn’t allow the ambitious Gibbs to yank her around the court. What the 30-year-old Serena has become over her very long career is professional when going about her business, and while she has a large and strong team around her, she is very active in managing her own career. After her stunning loss to Virginie Razzano in the first round of Roland Garros, she decided to stay in Paris and practice at the Patrick Mouratoglou Academy in France. She then brought the intense and analytical Mouratoglou onto her team at Wimbledon. He received a big thank you after Serena won the title. He would not take a lot of credit, even though he clearly deserved some, and pointed to Serena, whom he said can set an example for almost every player. "She’s already an unbelievable champion, so it’s just about the details," Mouratoglou said. "She’s 100 percent into her tennis project. The ability to find solutions to win all the time, even when she’s really playing bad, she was maybe not that confident at the start of the tournament and found a way to win. "She’s unbelievable as a personality and as a character. The will she has, the motivation she has. I think she has everything you can expect from a champion. So 99 percent of the job is already done. She wants to improve every day, to succeed, and she does everything 100 percent. She’s fighting every point. What else could you ask from any player?" Serena knows that she has a lot of points to defend during the Emirates Airline US Open Series, including her Bank of the West title, as well as her crown at the Canadian Open and the final of the US Open. While she is the favorite to repeat as the Bank of the West titlist, there are other talented players in the draw, including the sixth seed Chanelle Scheepers, whom she’ll play next, and third seed Dominika Cibulkova, whom she could play in the semis. After leaving Palo Alto, she’ll go home to L.A. for a small stretch and then leave early for the London Olympics, where she is aiming for her first gold medal in singles. 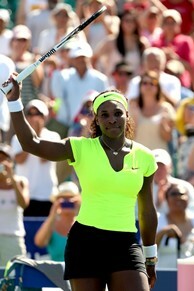 She might be a little tired this week, but winning gives everyone a buzz, even players as successful as Williams. "My goal is to do well here first and then go from there," she said. "I have the Olympics -- gosh, I keep forgetting about that, so gotta do [well there] -- and then I have the US Open. So it's a busy summer, and it's halfway through, but it's going so fast."